Does knowing that your life might be at risk inspire you to work toward a mindset of paying down debt? Do you know that the weight of debt can cost you more than the debt itself? It might be something as seemingly benign as worrying at work or during a family event. The worry and stress might infiltrate your relationships leading to conflict. It can certainly affect your physical or mental health. It is no surprise that people in debt have a higher level of dissatisfaction with their lives. It is not surprising they may feel more anxiety or depression. However, what is shocking according to the Aspen Institute: 16 percent of suicides are due to financial problems–including debt. Is debt having a negative impact on your life? Are the worry and stress associated with having debt stealing joy from your everyday? Are you in denial about your debt ratio? Let’s discuss the psychology behind the decision to get out of and your journey toward paying down debt! 1.4 Paying Down Debt: Watch Your Back (With That Banker)! 1.8 Paying Down Debt: Income vs Wealth? Did you know that the biggest way to impact your finances is the decision to start paying down debt? That’s right–just start. By not borrowing more money, you are on the road to freedom! Just like every journey you start has a destination, every debt you have has a destination (end), too! Wait..what? What is the snowball method? It is entirely possible that you’ve never even heard of the snowball method. You have been dealing with the stresses of medical school and residency. I can relate! My wife, Taylor, went through those exact same stresses! This is the type of stress that most of the population can’t even imagine: sleep deprivation, learning to deal with difficult patients (and staff), an incredible workload with little free time in which to regroup, maintaining finances with growing debt and your personal life. The list goes on. Now you have made a decision, you’ve stopped borrowing and you have a path to follow for paying down debt! You are officially on the journey to eliminate debt and embrace freedom. All you have to do is let the payments do their work! Ask yourself this important question: Do you have the habit of buying something you can’t afford by borrowing money to do it? These are habits that you need to overcome if you are interested in paying down debt! Paying Down Debt: Watch Your Back (With That Banker)! Truth: Banks trip over themselves to loan a physician (big) money! The reason is simple: A banker knows that a physician will make big money. A physician is in a stable job market and they are typically a low-risk group. Plus, when you start making big money–banks want to loan you big money! If we are talking about physician mortgage loans there are pros and cons. 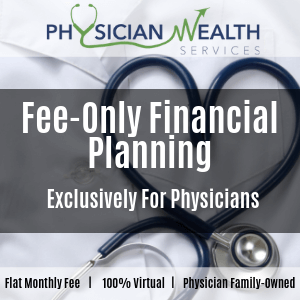 Want to learn more about physician mortgage loans? Here’s our most popular blog on the topic. However, today I am writing about why any loan, in general, can be dangerous to your goal of paying down debt and reaching financial independence. It’s simple: When the bank offers you a larger loan, it can lead to you borrowing more than you can really afford. You might feel the urge to grab a good thing and run…. Thus begins the ripple effect. In addition to the dangers stated above being offered and taking out a larger loan than you actually need will affect your budget and limit your future options. Is a loan really necessary? Choose wisely and take out only the amount needed for your needs! Planning ahead can take the stress out and put back the fun! Are you a victim of Debtabetic Neuropathy? Has being in debt been normalized for you? Everyone seems to have it. Debt surrounds us. It seems to be normal. From school loans to consumer credit cards. It is even common for stores to ask if you would like to put your purchases on their credit card. Oh…You don’t have our card? One of the steps to paying down debt should be becoming aware that you are being lured into it! Remember when you made the decision to get out of debt? Then you started paying down debt? Just say no…to adding more debt to your journey! Are you striving for financial independence and the option to retire early? Financial Independence is an awesome strategy. It opens up options but it takes a mind shift. The question is how much of a mind shift is reasonable? There are different factions developing within the FIRE community. One of those groups is pushing for the earliest possible retirement and live life out in a type of frugal retirement. The members in this camp believe in an ultra-frugal lifestyle in their quest to work toward paying down debt or reaching FI (financial independence). They are the Lean FIRE group. I’m concerned about this group. If you retire between 33-35 years old with less than a million, because right now they are living on $18k, I’m thinking just wait for a down cycle. This is too tight and they might not be able to keep it up. The FAT FIRE group is more moderate. They believe in using enough money to pursue their hobbies or afford travel. They spend time striving to earn additional money to reach the end goal of financial independence and retiring early. You should be able to enjoy the journey of life and still reach your destination! Paying Down Debt: Income vs Wealth? I wrote a blog on The Makeup Of a Physician Millionaire and How to Become One. My friend Sarah Fallaw, who is the owner of DataPoints and the Author of The Next Millionaire Next Door, and I discussed being “income statement affluent”. Read the blog and listen to the show with Sarah Fallaw! Being “income statement affluent” is not the same as “balance sheet affluent”. These physicians may have a high monthly income, but not have any money! These physicians aren’t saving. If a physician is not balance sheet affluent and they suddenly lost their job–they would be destitute! It seems to be a problem in this country. For illustration purposes: When we buy a car we tend to look at only what the payment will be. We want to know how the monthly income will impact our income. What we need to look at is the total cost of a car. That would involve thinking about how the interest and length of the loan impacts the long-term total cost of the car. The first example is looking at a car in an income-oriented way. The second example is looking at buying a car in a wealth-oriented way. Which car buying mindset will lead you to get more bang for your buck? If you are thinking of paying down debt faster–which buying ideology should you adopt? The answer to that simple question could make a world of difference in paying down debt and achieving personal happiness and financial independence. The answer to that question could also give insight to your need to fill a void. Buying more material things might give you a brief mood boost in the face of depression or anxiety, but it is a temporary fix. If you never reach the point of having enough (contentment)–you will become stuck in a cycle of “needing” more. In the long run, such a compulsion may be destructive to your relationships and finances. It will certainly derail your attempts at paying down debt or becoming financially independent. So, in other words, the whole reason you have financial problems is the lack of contentment! I believe “You can have anything you want, but you can’t have everything you want”. You need to be able to live a little and “splurge” sometimes. Pay yourself first–and then treat yourself occasionally. Even when paying down debt, If you keep yourself on too tight a reign, you might bust loose and binge! Sometimes spending money and being on too strict of a diet are very similar! Select the things that you enjoy the most for those occasional extravagances! Being on a budget helps. It is all about cash flow planning. You are telling your money where you want it to go. Having a budget will help you direct your money when you are paying down debt. You get to choose. You get to prioritize. Missed the show with Steve Crawford on how to build a budget? Here’s your opportunity to hear it. I write a lot about the emotion and psychology behind money. I believe that the way you were raised and how your family dealt with money has a huge impact on how you handle your finances (or the way they handle you)! Having a budget and planning your cash flow will assist you in reaching your goal of becoming financially independent. It is your ticket to freedom! What is your plan for paying down debt? Have you made a firm decision to become debt-free? What is your plan for paying down debt? Have you tried to pay down debt unsuccessfully in the past? What has made a difference in your success? We would love to learn what made the biggest difference in your ability in paying down debt. This is a discussion worth sharing with your closest friends and family. Share the podcast to start one up!